Rakhi is originally a Hindu festival which has become more secular in the recent times, thanks to other religions celebrating it too. A festival which celebrates one of the purest forms of love that is, the love of a brother and a sister, Rakhi is not only widely celebrated in India, but also beyond the borders. 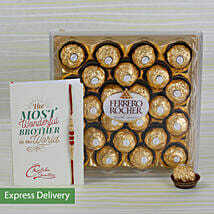 Every year the brother vows to protect his sister from all evils on the day of Rakhi. 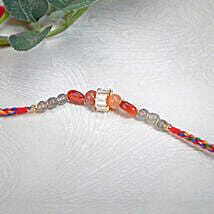 The sister prays for her brother’s good health and longevity and ties a rakhi around his wrist. Exchange of gifts as well as blessings take place. 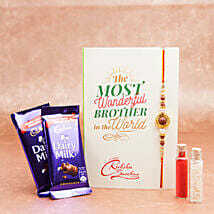 But If you brother is away in Solapur on Rakhi, you can send your love by sending a rakhi to Solapur. In this modern era of online shopping, gone are the days when you would have to physically visit a rakhi store, buy a rakhi and send it to your brother in Solapur via courier or post. Now you can relax at your home or office and buy rakhi online. Just visit our online portal, select the rakhi of your choice from our wide range of rakhi collection, specify the delivery address in Solapur and leave the rest to us. 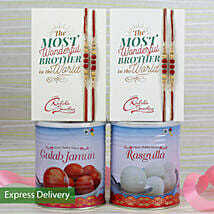 We make sending rakhi to Solapur online easy. 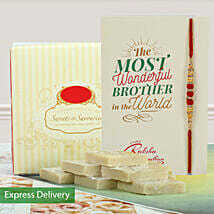 Apart from whole rakhis, you buy and send rakhi threads to your brother via our portal too. When we say that we guarantee a speedy delivery, we mean it. 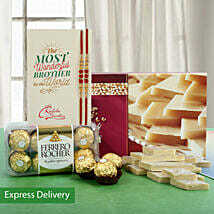 Enjoy high speed rakhi delivery in Solapur thanks to our expert and efficient delivery team. 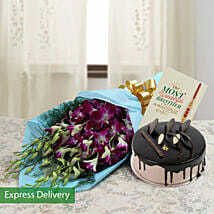 We also provide added facilities of same day delivery and free shipping. 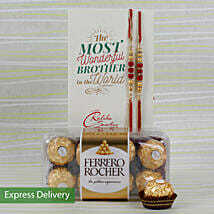 You can also send rakhi gifts for Bhaiya and Bhabhi online through us.